Cops, panicked, jog by. A Range Rover swerves through an alley, screeches to a halt and backs into a police car. Metal crunches, glass shatters, and in the background a familiar accent is shouting for the cops to “shoot him! Shoot him!” This isn’t a movie. It’s just another Monday in New York City. The incident I’m describing above, and which you can see in the videos below, occurred on Monday, June 6th in the Manhattan neighborhood of Inwood, according to The Drive. The Range Rover in question failed to yield to police after making an illegal turn, resulting in a car chase that, for a rather dramatic moment, got trapped in this alleyway. 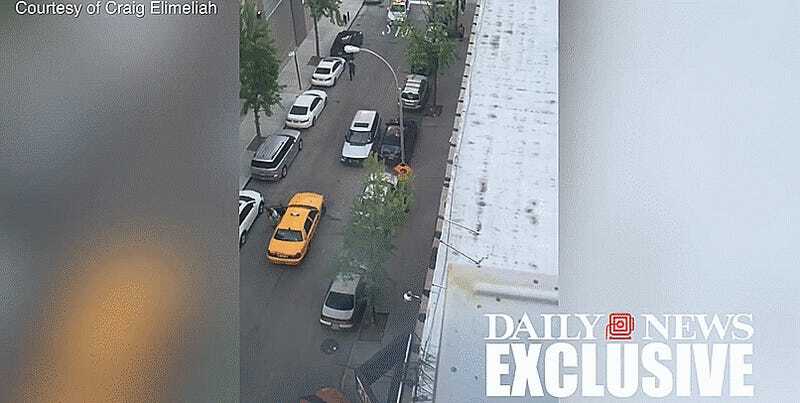 The suspect in the Range Rover managed to temporarily evade the police despite bystanders’ many cries out to the police to open fire on the driver after ramming the SUV into a taxi and almost crushing its driver. The suspect attempted to stop and flee from the vehicle a few moments later and was taken into custody.